The Community Garden Coalition is so grateful to our many donors through the CoMoGives campaign in December. We couldn’t be more pleased with the results and the generosity of this community. We’ll do our best to use those funds to keep supporting and nurturing community gardens in 2018. P.S. If you meant to donate, but missed your chance in December, it’s not too late! We can accept donations year-round at this link. And thank you again for your support! Our good friend Dan Cullimore passed away recently. Losing Dan is hard. He was generous with his time. He was smart and funny. He was someone you could go to with all sorts of questions. His positive attitude was one of his most endearing and helpful attributes. For the Community Garden Coalition, Dan was first a gardener at the Circus-Lyons Community Garden (which he helped establish), then a garden leader there, then a board member. He eventually became president of the board and led our organization until he needed to resign to focus on his health earlier this year. Having Dan at the helm helped us feel assured. He was an excellent ambassador for our group and for community gardening in general. He was reasoned and thoughtful when it came to making tough decisions. He even helped us grow up a little as an organization by working to formalize a variety of policies and procedures – no one’s idea of fun, but something that needed to be done. The outpouring of kind words and remembrances from friends and family is a reminder of the place Dan occupies in our hearts and community. We will miss him greatly. We will carry his spirit with us. What would your donation buy? The Garden Coalition needs your donations through CoMo Gives this December. Ever wonder what it costs to help support a garden? Here are some examples of what we could do with your donation. As frost creeps over the veggies, the weeds and the soil, the gardening season is coming to a close in Mid-Missouri again. Before you shift away from thinking about gardening for the winter, please do the following. If you’re at a community or group garden, let your garden leader know whether you’re planning to return next year. This will help leaders know what plots will be available for newcomers. Clean up your plot. If you need tips on how to put your garden to bed for the winter, consult your garden leader. Consider making a year-end donation to the CGC to help with maintaining your community garden next year. We’re a very small, all-volunteer non-profit, and even modest contributions help us fund water, mulch, tools and more to support community gardening in Columbia. Donate here today, or wait for December when the CGC will be participating in the CoMo Gives local giving campaign. This weekend, April 8 & 9, from 10 a.m.-2 p.m. on Saturday and Noon-2 p.m. on Sunday, the CGC will have broccoli, green and red cabbage, cauliflower, brussels sprouts, kale, lettuce and swiss chard seedlings available for those gardening at our member gardens. Plants will be distributed at the Claudell Garden, 711 Claudell Lane. If you are able to make a donation of 25-50¢ per plant, this helps offset our costs of buying and transporting them. We ask that you give what you can, but you will not be refused for lack of a donation. We may also have some row cover available. This lightweight material can help protect young plants from chewing insects while still letting light and water through. It is used with metal hoops to hold it up over your plants. We suggest a donation of 25¢ per linear foot. Please note: we can only offer this service to those gardening in our member gardens, not the public at large. This weekend, April 2 & 3, from 10 a.m.-2 p.m. on Saturday and Noon-2 p.m. on Sunday, the CGC will have broccoli and cabbage, kale, lettuce and chard seedlings available for those gardening at our member gardens. Plants will be distributed at the Claudell Garden, 711 Claudell Lane. We are requesting a donation of 25-50¢ per plant to offset our costs of buying and transporting them. We ask that you give what you can, but you will not be refused for lack of a donation. Also: row cover! This lightweight material can help protect young plants from chewing insects while still letting light and water through. We will have some available, along with metal hoops to hold it up in your garden. We ask a donation of 25¢ per linear foot. GetAbout Columbia, in partnership with Columbia Parks and Recreation and the Community Garden Coalition, is offering a free community gardens walking tour. Join us Monday, September 8, 6:30-8:00 p.m. for a look at three diverse community gardening projects in south central Columbia. 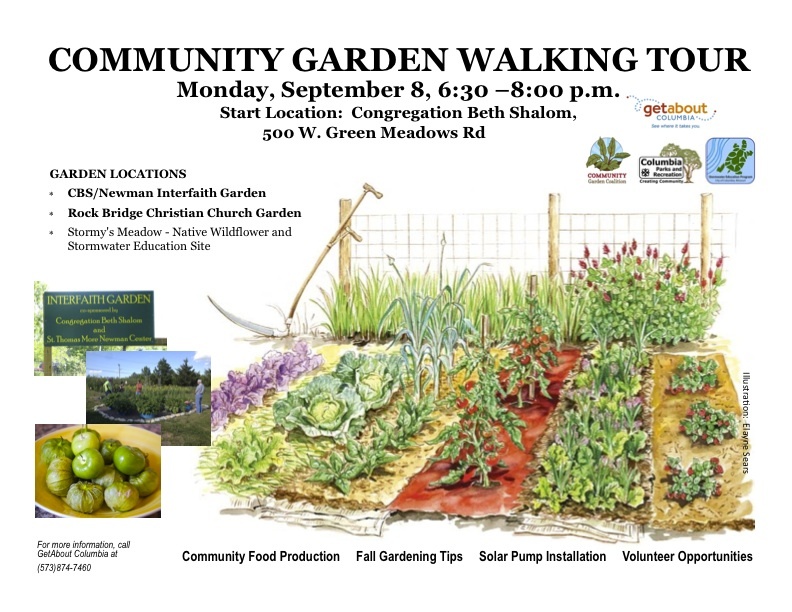 The garden tour will include the Congregation Beth Shalom Interfaith Garden, Rock Bridge Christian Church Garden, two giving gardens that are part of the Community Garden Coalition, and Stormy’s Meadow, a native wildflower and stormwater education site, which just became one of our newest member gardens. Guest presenters will focus on how these gardens foster community and help feed the hungry as well as discussing gardening tips and volunteer opportunities. This event is free and open to the public. No registration is required. Meet at Congregation Beth Shalom, 500 W. Green Meadows Rd. The walking tour will begin promptly at 6:30 p.m. For special accommodations, please contact Janet Godon at (573) 874-7460 or jlgodon@gocolumbiamo.com.